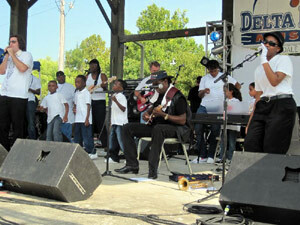 be sure to include the Delta Blues Museum. 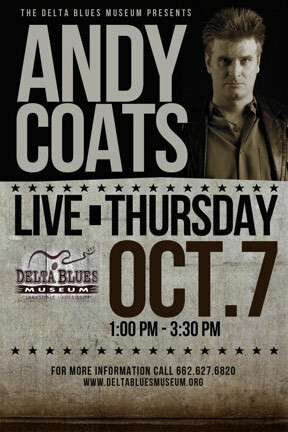 On Thursday, October 7, Andy Coats will perform at the museum from 1:30 - 3:30. Born in the Piedmont region of North Carolina, Andy has been involved in music since his early teens. Immediately following Andy, the DBM students will be rehearsing in the classroom. Be sure to stop by on Saturday, October 9, for coffee and homemade muffins in the morning and take advantage of the Super Sales going on in the Gift Shop. Special items will be 10% off and we will have a $1 sales bin, free giveaways and more. Saturday afternoon from 2-4 the Delta Blues Museum Band will perform at the museum under the direction of Terry "Big T" Williams and Richard "Daddy Rich" Crisman. The students are currently working on a CD to be released this fall. The Delta Blues Museum is located at #1 Blues Alley in downtown Clarksdale. The museum is open Monday through Saturday, from 9 AM to 5 PM. For more information, call the museum at 662-627-6820 or visit the DBM Web site.